QUITO, ECUADOR (27/JUN/2013.) - Ecuador's government announced on Thursday that it waives tariff preferences it receives from the United States due to the pressures of the case of former U.S. spy Edward Snowden, who sought asylum at the South American country. The communications secretary of the Presidency of Ecuador, Fernando Alvarado said Ecuador "does not accept pressure or threats from anyone, and does not trade the principles for the mercantile interests, however important they may be". "The preferences were granted to the Andean countries as compensation for their fight against drugs, but soon became a new instrument of blackmail. Consequently, Ecuador resignation unilaterally and irrevocably to these preferences," Alvarado said in a press conference. Almost half of Ecuador's foreign trade is destined to the United States, mainly oil, flowers, frozen vegetables, bananas and shrimp, which along with the other products in 2012 totaled more than 10 billion dollars. Alvarado said: "Moreover, Ecuador offers the United States an economic aid of $ 23 million per year, an amount similar to that we received from the tariff preferences in order to provide training in human rights and helps to avoid attacks on the privacy of individuals, torture, extrajudicial executions and other acts injurious to mankind." "We express our love, appreciation and respect for the American people with whom we always have had excellent relations and we sympathize for the massive espionage they have suffered," he added. He stated: "We would be delighted to accept Mr. Snowden on Ecuadorian soil, with all the urgency that is required... They have accepted many Ecuadoran fugitives as refugees in the United States, particularly the corrupt bankers who have broke the country in 1999, whose extradition has been repeatedly denied by the United States. " Alvarado was referring to a dozen bankers who fled the country after their institutions could not provide customer deposits, which led to thousands of family dramas. At that time went bankrupt or closed half of the 42 existing banks causing a deep economic crisis that brought the country to the brink of hyperinflation. 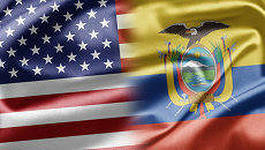 The Ecuadorian government analyzes from Sunday the asylum request of former employee of the National Security Agency of the United States, who revealed plans of spying on citizens by the government of their country. He was hiding in Hong Kong and then moved to Moscow, where he remained on Thursday waiting to define his future. Regarding the request for asylum, former U.S. spy argued that "he is unlikely to receive a fair trial and a pretrial humane treatment, besides running the risk of life imprisonment."